Interstate Specialty Products die cuts Fluorozone, a premium-performance FKM fluoroelastomer with a temperature range of -20° F to 400° F. With its high fluorine content (66%), Fluorozone exhibits good resistance to many aliphatic hydrocarbon fluids. This fluoropolymer also resists a wide range of oils, fuels, and lubricants, and most mineral acids. Applications for die cut fluorozone include custom seals and gaskets. Using precision die cutting, Interstate converts rolls or sheets of Fluorozone into die cut gaskets in a range of sizes and with tight tolerances. Made in the USA by WARCO WILBRITE, Fluorozone is available in standard roll widths of 36” and 48”, and in molded sheet sizes of 36” x 36” and 48” x 48”. Roll thicknesses range from 1/64” to 1/4”, and molded sheets are up to 4” thick. Custom widths, thicknesses, and lengths are also available. Fluorozone FKM rubber sheets and slabs do not contain reground or recycled materials. Instead, they’re made of 100%-virgin 3M Dyneon fluoropolymer for long-term protection against high temperatures and corrosive chemicals. Fluorozone’s FKM designation indicates that this heat-resistant and fluid-resistant material is part of the fluoroelastomer category in the ASTM D1418 standard. Fluorozone complies with the requirements of RoHS, REACH, and California Prop 65. Fluorozone has a hardness of 75 durometer (Shore A), a typical tensile strength of 1250 psi, and a typical ultimate elongation of 300%. 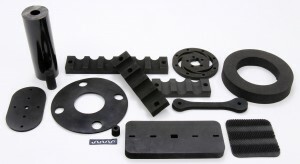 In addition to die cut gaskets, industrial applications for Fluorozone FKM rubber sheets include hydraulic O-ring seals, diaphragms, electrical connectors, flue duct expansion joints, and liners. Applications can also include valve and manifold gaskets, valve stem seals, and fuel injector O-rings. In the aerospace industry, Flurozone FKM rubber sheets can be used to create manifold gaskets, firewall seals, and O-ring seals used in fuel, lubricant, and hydraulic systems. Is premium-performance Fluorozone FKM rubber right for your industrial application? Interstate Specialty Products die cuts fluorozone sheets and rolls and supplies custom gaskets that can withstand high heat and industrial fluids. To learn how we can support your sealing and insulation application, contact us on-line or call (800) 984-1811.